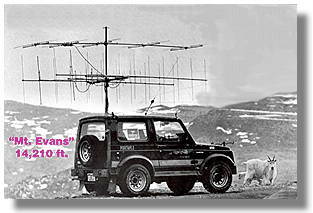 Why do I need Ham Radio in my 4x4? Everyone already uses a C.B. so why do I need Amateur Radio? Range and versatility are the biggest advantages. A C.B. radio is normally limited to local line of site contacts, which means that hills buildings, and even the curvature of the earth can all be limiting factors to the range of your transmissions. Amateur Radio operators or "Hams" have the added advantage of using repeaters to increase the range of reliable contacts. Repeaters can be located on mountain tops, tall buildings or tall free standing towers. Your signal is sent from your location, to the repeater and is instantaneously retransmitted from the repeater location over a wide spread area. This can be extremely helpful when four wheeling or camping in remote locations. Some repeaters have autopatch capabilities, which means you can make telephone calls from your radio. There are thousands of amateur radio repeaters located across the country and they are often located on top of the mountain ranges we do our wheelin' in. High Frequency amateur radio equipment (HF) is capable of communicating with stations anywhere in the world using voice, Morse code, Slow Scan TV and many other modes of communications. With a "packet radio" a GPS unit and APRS (Automatic Packet Reporting System) software, you can keep track of vehicles on a moving map, transmitting the information to any number of monitoring stations. Hams have used this system for years while providing communications assistance for bike races, walkathons and parades. 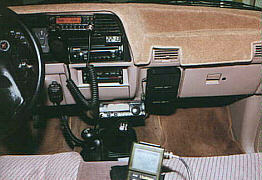 Many Hams have installed APRS in their vehicles as a vehicle locator system. When they leave their vehicle they turn the system on and the system sends out a "packet burst" every few minutes. Hams have called their local police and told them that there car has been stolen and then they tell the police exactly where it's located. This system was in place before LOJACK. Do I need a license to operate a Amateur Radio station? YES! A license is a must, but don't worry there is no longer a requirement to learn Morse code and the theory for the written test can be learned by many people over a weekend or two. The Technician license permits you to use all VHF/UHF amateur radio frequencies, use transmitters capable of up to 1500 watts output, use satellites for re-transmitting your signal and many other privileges. For a very capable package that can be used while your offroad, I recommend a high power mobile unit capable of at least 40 watts. A dual band mobile (VHF/UHF) with crossband repeater capabilities is even more desirable because you can use the radio in your own truck as a repeater while you are out hiking with a HT (handi-talkie). HT's are low power units producing up to 7 watts output, which is why I don't recommend them as your primary unit. I'm interested how can I get more information? Try to find an amateur radio club in your area. Many Hams are already involved in four wheeling so if there is a ham in your 4x4 club ask him to show you the ropes. The ARRL (Amateur Radio Relay League) is a national organization for amateur radio operators. Their website can provide you with much more information about getting started. Communications equipment installed in my Explorer. ashtray, Kenwood 160-10 meter all mode transceiver. Between seats, Magellan Trailblazer GPS.